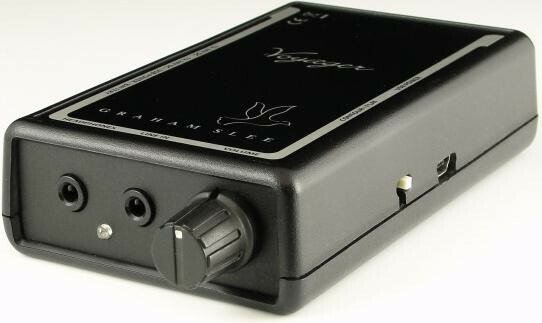 The Graham Slee Voyager is a high quality portable headphone amplifier, developed over two and a half years by ex-broadcast engineer Graham Slee to improve and amplify the signal from your iPod, mp3 player, mac, laptop, etc - for home or portable use. The Voyager is even so close in size to an iPod Classic (and only 100g) that you can easily carry them together. The Voyager has many uses. Use a 3.5mm to 3.5mm jack cable to connect it to any line level source - your mp3 player, minidisc player, portable DVD player, laptop, PC etc. However, to get a real boost in performance with an iPod, we recommend connecting to the iPod port socket, using the iPod port to 3.5mm cable, which bypasses the iPod's internal volume control. If you are new to the idea of a headphone amplifier, the logic behind this little wonder is that it not only increases the volume possible, but brings out the magic in the music. In many listening sessions, we noted significant improvements when using a Voyager; bass is more defined, the midrange is detailed and warmer and there is greater clarity in the treble. Many headphone sockets are a cheap "last minute" additions. Add the Voyager inbetween and hear what you've been missing. Ear candy, pure and simple. 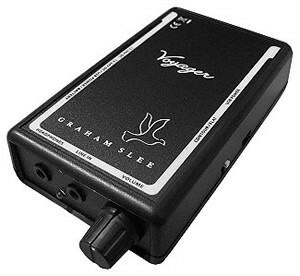 The Voyager is powered either by a UK mains adaptor (included), a standard 9V battery (included) or from any USB socket. 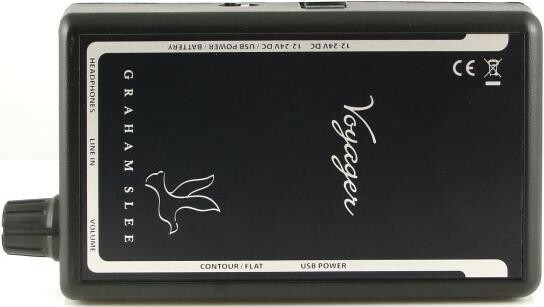 The Voyager works well with most headphones and offers a slice of Graham Slee reference quality headphones listening for a very reasonable price, with the bonus of portability. It's also energy efficient - a single battery gives around 50 hours of listening pleasure.